The cumulative review workbooks provide ongoing review of the material previously learned to help students retain core mathematical concepts that are critical to succeed in current and higher-level MATH courses. This Cumulative Review Workbook for each grade level can be used to supplement your MATH curriculum. 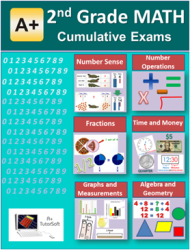 It contains cumulative exams, exams answer keys, and solutions manual with a step-by-step solution to each exam problem. Students may use space provided under each exam problem to show their work.